The case of Janus v. AFSCME, pending in the Supreme Court, is the latest effort by a combination of conservative groups and individuals to diminish, if not destroy, public sector labor unions. 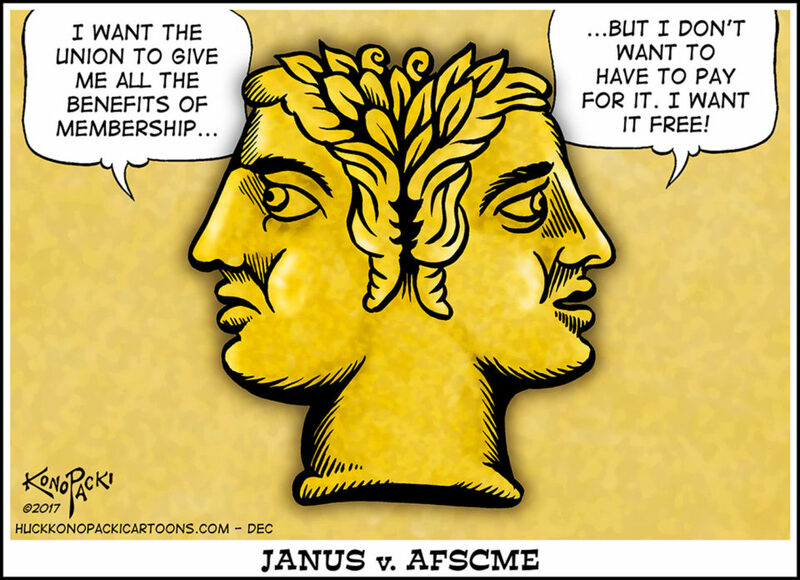 The Janus attack is aimed at substantially reducing union funding, to impair their ability to represent employees. It was not until the administration of president Franklin Roosevelt that federal legislation, in 1935, authorized private sector employees to form labor unions and negotiate collective bargaining agreements, and protected employees from unfair labor practices. The National Labor Relations Act allowed labor unions to exclusively represent employees of an employer, in appropriate bargaining units, and to bargain over wages, hours and terms and conditions of employment. The public sector lagged behind. In California, it wasn’t until 1976 that the Legislature adopted the Educational Employment Relations Act (EERA), which brought the federal model to the public schools and community colleges. Eventually, the State extended this model to all California public employees. As does the NLRA, the EERA imposes on unions a duty to “fairly represent” all the employees in the bargaining unit. For almost half a century, a corollary of this duty of fair representation is that employees who choose, for whatever reason, to not join their exclusive bargaining agent, must pay a “fair share” or “agency” fee to support the union’s performance of its representational responsibilities. Excluded from the agency fee are certain political activities. The anti-labor groups funding Janus claim that it is unconstitutional for the government, through labor laws like the EERA, to require non-members to pay agency fees. Their argument is that because public sector unions negotiate with public employers over the expenditure of public monies, that every proposal a union makes and every action a union takes is “political.” In other words, compelling non-members to support collective bargaining forces non-members to “speak,” and thus violates the First Amendment. They argue that everything negotiated, from academic freedom, to grievance procedures, to assignment policies, to intellectual property rights, is “political,” and prevent the collection of agency fees. The one public employee making these claims in Janus lost in the federal district and appellate courts, and then appealed to the US Supreme Court, which agreed to hear his case. AFSCME has made a persuasive argument that the agency fee process, in effect since the Supreme Court decided the Abood case in 1977, is constitutional. More than 40 groups filed friend-of-the-court briefs supporting AFSCME. These included a number of constitutional law professors and other labor unions. If the Supreme Court sides with Janus, unions which have large contingents of non-members will be at a serious disadvantage in representing every employee, including the non-members. So much is riding on the Janus decision. The Supreme Court heard oral argument on February 26, and a decision is expected in the spring or early summer. The amicus and party briefs can be found at the SCOTUS blog.